Irrigation: Eksklusiewe Landskappe | Exclusive Landscapes specializes in manual and automated irrigation systems to suit your individual needs. We prefer to use the Rainbird Irrigation system which is known to be very user-friendly and guaranteed piping for residential as well as corporate gardens. On clients request or in more arid areas, a more water-wise system can be installed, that utilizes rainwater with municipal water as backup. Water is accumulated in a reservoir tank and uses a pressure pump to create the necessary pressure. 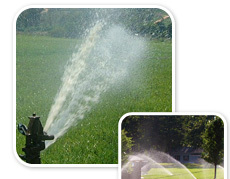 Special water efficient nozzles or drippers are then used to ensure optimal utilization of available water.